Ganesh, G.N.K., et al. 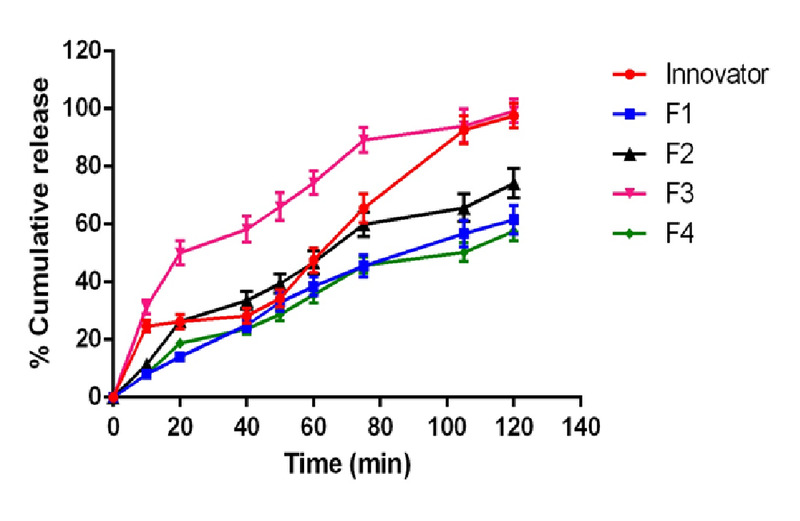 Formulation and Evaluation of Dexlansoprazole Delayed Release Capsules. (2016) J Pharm Pharmaceutics 3(1): 61- 69. © 2016 Ganesh, G.N.K. This is an Open access article distributed under the terms of Creative Commons Attribution 4.0 International License. Dexlansoprazole (DSP) is a proton pump inhibitor, used in the treatment of gastroesophageal reflex disease (GERD) and ulcer colitis. DSP acts by reducing the quantity of acid in the stomach. DSP is an acid liable drug which can bed egraded in acidic pH of the stomach. 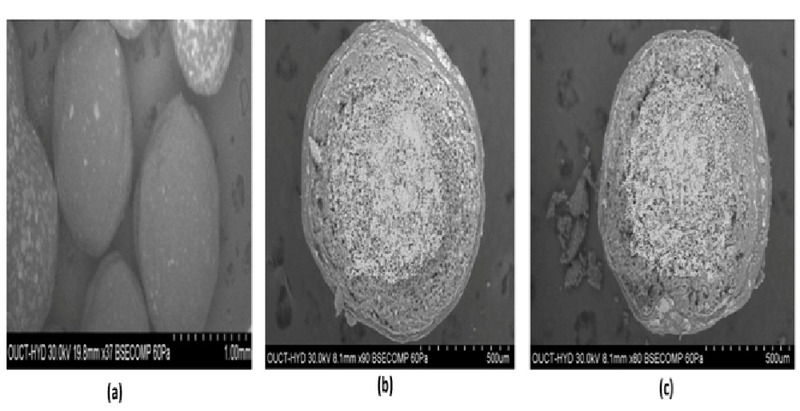 A coating method was employed to delay the release of drug in stomach which can prolong the pharmacological action.Sugar spheres (#25, #30) have been used as inert core material for drug coating using the technique of pelletization. Delayed coating, IR coating and ER coating of drug was done by using L-HPC-31, HPMC phthalate-55, Eudragit-RSPO and Eudragit-RLPO respectively. 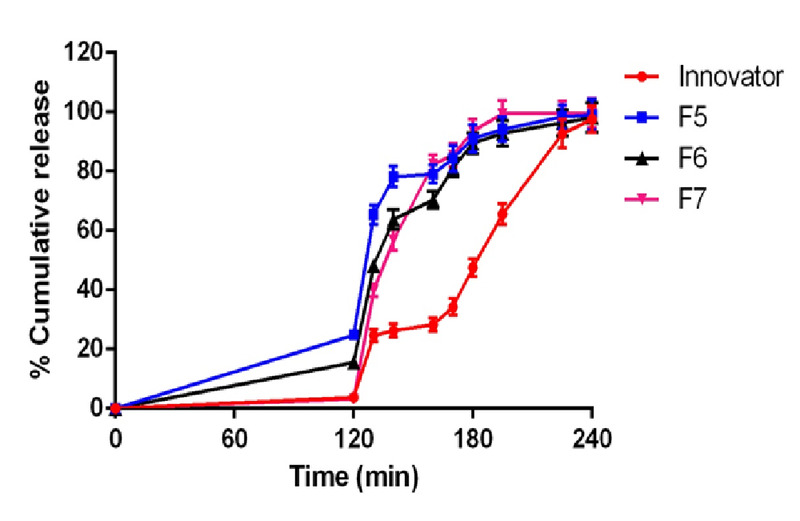 Among the different batches F14 formulation containing 25:75 ratio of immediate release and extended delayed release coating was selected, as retardation of the drug was observed in acidic pH of stomach. Gastroesophageal reflux disease (GERD) is a chronic symptom of mucosal damage caused by stomach acid coming up from the stomach into the oesophagus. GERD is caused by the changes in barrier between the stomach and the oesophagus, including abnormal relaxation of the lower oesophageal sphincter. The most common symptoms include heart burn and regurgitation. Medications such as proton pump inhibitors, H2 receptor blockers and antacids are used in the treatment of GERD. DSP is a proton pump inhibitor drug used in the treatment of GERD. However, it is degraded in acidic stomach pH, thus lacking in pharmacological action of the drug. Pelletization of DSP and coating of various polymers prevents rapid degradation and also produces prolonged action. Pellets are agglomerates of fine powder or granules of bulk drug and excipients. It has various advantages which include improved appearance of product, less dose dumping, improved safety and efficacy and free dispersion in the gastro-intestinal tract. However, filling the pellets into the capsules is a difficult process[3,4]. Pelletization theory clarifies the process of pellet formation which involves rotating drum, a pan or disc equipment and have nucleation, coalescence and abrasion transfer as process[5,6]. Most common pelletization techniques include compaction, agitation, layering and globulation[7,8]. Inert material such as sugar sphere is coated with drug and various polymers such as hydroxypropyl cellulose-31, hydroxylpropyl methyl cellulose phthalate-55 and Eudragit (RSPO and RLPO). The main purpose of coating is for delayed, immediate and extended delayed release of DSP. Coating of DSP with various polymers prevents the rapid degradation in acidic pH of stomach, hence enhances pharmacological activity. Sugar spheres (#25#30) and DSP sesquihydratewas obtained as gift sample from Arun Pharma, IDA, Hyderabad, India and MSN Labs Hyderabad, India, respectively. Sucrose (milled) USP was procured fromMB Sugars, Maharashtra, India. Magnesium carbonate was procured from Deadsea bromine, Israel. Hydroxypropyl cellulose (HPC) USP was procured from Ashland, USA. Hydroxypropyl methyl cellulose (HPMC) phthalate – 55 USP and L-HPC -31 USP were procured from Shinetsu, Japan. Eudragit RSPO USP and Eudragit RLPO USP were procured from Evonik, Germany. All other chemicals used in this study were of analytical grade. Calibration curve of DSP in 0.1N HCl (pH 1.5) and pH 6.8 Phosphate buffer: A standard drug solution of DSP was prepared by dissolving 100 mg of DSP in 0.1 N HCl solution in a 100 mL volumetric flask and the volume was adjusted with 0.1N HCl solution to the concentration of 1000 jμg/mL. From this solution 10 mL was withdrawn and diluted to 100mLto get a concentration of 100 μg/mL. Further, from 100 μ/mL, aliquots of 1 mL, 2 mL, 3 mL, 4 mL and 5 mL were pipetted into 10 mL volumetric flasks. The volume was made up with 0.1N HCl buffer to get the final concentration of 10, 20, 30, 40, and 50 μg/mL respectively. UV-Visible spectrophotometer is used to record the absorbance value at 286 nm against 0.1 N HCl as blank. Experiment was repeated for six times in order to obtained consistence and graph was plotted. 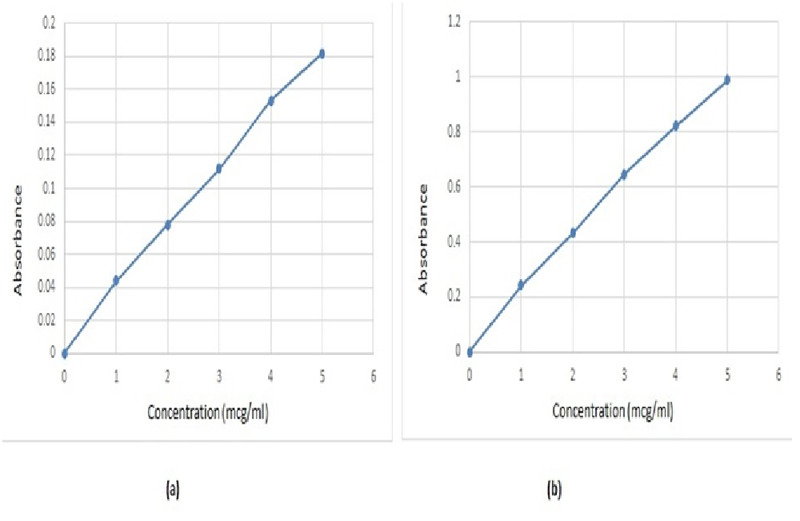 Similarly, pH 6.8 phosphate buffers was used for construction of calibration curve by taking similar concentration and drug amount at 286 nm in UV- Visible spectrophotometer using pH 6.8 phosphate buffer as blank. Melting point determination: Melting point apparatus-934 (VI-05, Veego Instruments) is used to determine the melting point of the DSP. 2 mg of drug is placed inside capillary tube which is sealed at one end. Capillary tube is placed inside the apparatus and heater is turned on and the temperature at which the drug was melted was noted by visual observation. FT-IR (Fourier transform infrared spectroscopy) studies: Infrared spectra matching approach was used for detection of any possible chemical interaction between the drug and the polymer. The drug, drug polymer and polymer was taken and mixed with the suitable quantity of potassium bromide. About 100 mg of this mixture was compressed to form a transparent pellet using a hydraulic press at 15 tons pressure. It was scanned from 4000 to 400 cm-1 in a Perkin Elmer FTIR spectrophotometer. The IR spectrum of the physical mixture was compared with that of pure drug and polymers, which were matched to detect any appearance or disappearance of peaks, using FTIR peak matching method. 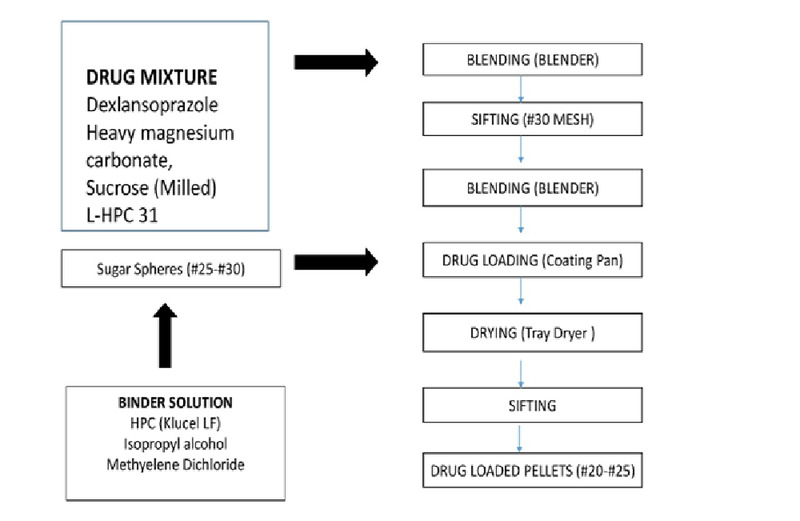 Preparation of drug mixture[9-12]: DSP sesquihydrate, heavy magnesium carbonate, sucrose (milled), and L-HPC-31 were weighed accurately and blended in #31 blender for 5 min. (Figure 1) explains the process of pelletization. The resultant is transferred to #30 blender and blended for 5 more min. Isopropyl alcohol is used as solubilizing agent for HPC under stirring condition to obtain a clear solution. Methylene dichloride was added along with titanium dioxide and talc in similar fashion to obtain clear solution of barrier coating. Final solution was passed through nylon mesh. DSP was added to the coating pan along with sugar sphere (#25-30#) for coating of drug followed by tray drying for 30 min at 35° ± 5°C. Dried pellets were collected in polyethylene bags after sieving through (#18 and #25). Preparation of immediate delayed release coating: Isopropyl alcohol was used as solubilising agent for HPMC pthalate-55 under stirring condition to obtain clear solution. Triethyl ether, titanium dioxide and talc were also used in similar fashion to obtain uniform dispersion. Final solution was passed through nylon mesh. Barrier coated pellets were again coated with immediate release coating followed by drying in fluidized bed dryer for 10 min and transferred to pre-labelled high density polyethylene (HDPE) container lined with double polyethylene bags. Preparation of extended delayed release coating[13-14]: Isopropyl alcohol was used as solubilising agent for Eudragit-RSPO and Eudragit- RLPO under stirring condition to obtain clear solution. Triethyl citrate, titanium dioxide and talc in similar fashion to obtain uniform dispersion. Final solution was passed through nylon mesh. Previously prepared barrier coated pellets were coated with extended delayed release coating and dried in FBP and sifted through #16 and #22. (Figure 1) explains the process of pelletization. Bulk density: It was determined in measuring cylinder by using 50 g pellets. Tapped density: Density tester was using for this procedure in which graduated cylinder was filled with specified mass of pellets and mass of pellets was checked after 500 taps. Weight variation test: Twenty capsules were weighed individual and average weight was calculated. Weight variation was calculated by using below formula. Acidic stage: USP- I (basket type) equipment and 0.1N HCl was used as medium for this study. 60 mg of drug loaded pellets were dropped into 750 mL of 0.1N HCl for 2 h. 5 mL of sample was withdrawn from the above solution which was filtered by using 0.2 μm dissolution disposable filter. Above solution was used for determination of solubility of drug in UV-VIS spectrophotometer at 286 nm using 0.1N HCl as blank. Remaining 250 mL was subjected to buffer stage of analysis. Buffer stage: USP- I (basket type) equipment and pH 6.8 Phosphate buffer solution was used as medium for this study. 250 mL of concentrated buffer solution was added each bowl containing 750 mL of 0.1N HCl. 5mL of sample was withdrawn from the above solution which was filtered by using 0.2 μm dissolution disposable filter. Percentage drug release of DSP was determined in UV-V is spectrophotometer at 286 nm using buffer as blank. Kinetic analysis of dissolution data: To examine the pattern of drug release, various drug release kinetic models representing zero order, first order and Higuchi’s square root of time kinetics were employed. Scanning Electron Microscope (SEM): SEM was employed to verify the surface microstructure imaging for visualization of shape and morphology of the DSP pellets. The internal morphology of pellets was studied by depositing 1 - 2 mg of each sample on sample holder, coated with gold-palladium alloy (150 - 250 Å) with a sputter coater followed by air-drying. The surface morphology of the samples was observed under a scanning electron microscope. (ZEISS EVO-18 electron microscope, Beijing Huilong technology limited). Scan for absorption maxima of DSP using 0.1N HCl and pH 6.8 phosphate buffer: UV-Visible spectrophotometer was used for the determination of absorption maxima of DSP using 0.1N HCl as blank at 286 nm and pH 6.8 PB as blank at 286 nm respectively. 1 - 5 μg/mL concentration of drug was used for analysis. (Figure 2) represent the standard graph and values of 0.1N HCl and pH 6.8 phosphate buffer. Melting point determination: Using the melting point apparatus, it was found that the melting point of DSP was 140°C. FT-IR Compatibility studies: The Spectra of drug, drug- polymer and polymer was obtained. It was observed that the characteristic peaks at 3448 (N-H stretching), 1638.58 (C=N stretching), 1358.97 (S = O stretching), 1467 (C-H bending), 1244 cm-1 (C-N vibrations) indicating no interactions between the drug and excipients (Table 1). Percentage moisture content: Percentage moisture content of all formulation was found to be in range of 1.14 - 1.18% using KF Titration method which was supposed to be under the limits. Tapped density and Bulk density: Bulk density of DSP pellets were found to be in the range of 0.66 - 0.74 gm/mL and tapped density was found to be in the range of 0.67 - 0.76 gm/mL. Weight variation test: Weight variation was found to be in range of 2.665 ± 0.08 to 4.92 ± 0.05 for enteric coated formulation which was under the limit i.e. NMT 10%. (Table 2) represents the value of bulk density, tapped density and weight variation for all formulation. Korsmeyer Peppas and Higuchi models were applied to the results obtained after in vitro drug release studies. F14 formulation n value was found to be 0.755 and drug release was found to follow anomalous diffusion. A coupling of diffusion and erosion mechanism was found. Drug release was supposed to follow first order release with r2 = 0.874, follows Higuchi’s equation r2 = 0.514 which indicates diffusion as mechanism. (Table 6) represent the values of kinetic model employed for % drug release of all formulations. SEM is used for shape, aggregation, and internal details of nanoparticles. SEM showed uniform particle with smooth surface morphology in F14 formulation. (Figure 6) SEM analysis result for delayed, immediate release and extended release pellets. DSP is proton pump inhibitor used in gastro-oesophageal reflex disease (GERD) which degrades at acidic pH in stomach. Enteric coating delays the release of drug in stomach thereby enhancing treatment. Sugar sphere (#25#30) was used as inert core material which was subjected to drug loading, barrier coating, immediate delayed releasing and extended delayed release coating. L-HPC-31 (5%) was used for drug retardation. Among the various formulations, formulation containing 7% of L-HPC-31(F3) showed better release in acid i.e., 99.2% at 120 min. HPMC phthalate-55was used for immediate delayed release coating; 10% of HPMC phthalate-55 (F7) showed better sudden and fast release of the drug (99.4% at 195 min) and also less acid drug release (3.2%). Eudragit-RSPO and Eudragit-RLPO used for extended delayed release at the concentration of 9% i.e. F12 showed better extended release of the drug (97.1% at 240 min) and also less acid drug release (2.5%). Enteric coated pellets were evaluated for dissolution solution (F14) enteric coated pellets were found to be optimized and were filled into capsules. These capsules were evaluated and the results were found to be similar to those of the reference. FTIR studies show no drug polymer interaction. 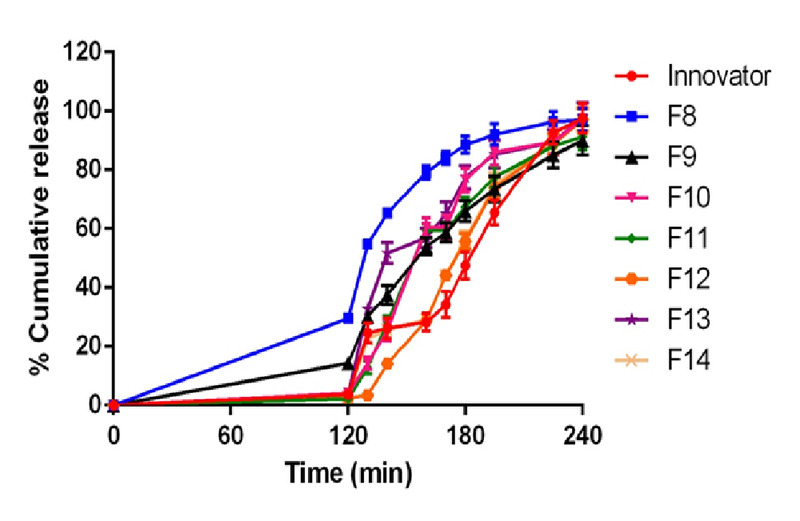 Different kinetic models were applied to optimized enteric coated formulation (F14) and observed it follows first order with non Fickian diffusion. SEM of optimized pellets F7 and F12 showed the surface was smooth and uniform coating. The cross section showed different layers of immediate and extended delayed release coating respectively. Based on the above data, it was concluded that DSP capsules (F14) formulation can be considered as a formulation for developing generic delayed release DSP capsule. 1. Wittbrodt, E.T., Baum, C., Peura, D.A. Delayed release dexlansoprazole in the treatment of GERD and erosive esophagitis. (2009) Clin Exp Gastroenterol 2: 117-128. 2. Sia, P.W. Pelletisation and Pellets coating 15th international symposium on microencapsulation. (2005) Pharma: 18-21. 3. Rowe, R.C., York, P., Colbourn, E.A., et al. The influence of pellet shape, size and distribution on capsule filling a preliminary evaluation of three-dimensional computer simulating using a Monte-carlo technique. (2005) Int J Pharm 300(1-2): 32-37. 4. Bodmeier, R. Pharmaceutical Pelletisation Technology. (1990) J Pharm Sci 79(7): 657. 5. Gothi, G.D., Parikh, B.N., Patel, C.N., et al. Patel DB. Pelletization. (2010) J Glo pharm Tech 2(1): 45-57. 6. Lavanya, K., Senthil, V., Rathi, V. Pelletisation Technology: A Quick Review. (2011) Int J Pharm Sci Res 2(6): 1337-1355. 7. Swarbrick, J. Encyclopedia of Pharmaceutical Technology. (2002) Marcel Dekker: 3096. 8. Hussan, S.D., Santanu, R.C., Verma, P., et al. A review on recent advances of enteric coating. (2012) IOSR J Pharmacy 2(6): 5-11. 9. Venkateswarlu, B.S., Jaykar, B., Pasupathi, A., et al. Formulation and evaluation of DSP delayed release capsules. (2010) Indian J Res Pharm Bio 1(1): 87-89. 10. Mylavarapu, P., Srinivas, P., Reddy, V.R., et al. Formulation and evaluation of duloxetine hydrochloride delayed release enteric coated Capsules. (2011) Int J Pharm Bio Sci 2(3): 152-172. 12. Material Safety Data Sheet of Titanium dioxide. (2013). 13. Material Safety Data Sheet of Triethyl citrate. (2013). 15. Costa, P., Sousa Lobo, J.M. Modelling and comparison of dissolution profiles. (2001) Eur J Pharm Sci 13(2): 123-133. 16. Paul, D.R. Elaborations on the Higuchi model for drug delivery. (2011) Int J Pharm 418(1): 13-17.